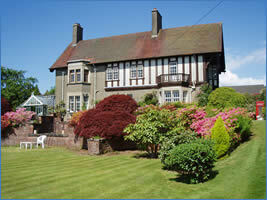 This large, detached villa is a grade B listed building in Helensburgh, Scotland, designed by John Burnett in 1911. Set in its own secluded grounds, this delightful and unique house has fine views of the Clyde Estuary and the Arran peaks beyond. In addition to being a member of Scotland's Best B&Bs, with a Scottish Tourist Board grading of 5 Stars Lethamhill is one of the top B & Bs in the country. Jane also holds the Welcome Host and Scotland's Best Service certificates. Lethamhill is a veritable Aladdin's Cave of fascinating collectables and memorabilia from old typewriters to slot machines. We are also the proud owners of one of the old red telephone boxes which now stands in our garden! At Lethamhill, we like to optimise the essence of B&B - the Beds, and of course the Breakfasts! All our beds are king-size (and not two single beds pushed together) and are luxuriously made-up with fine linens. Please let us know if you require the room to be feather free. Jane sources local produce where seasonally possible, including free-range eggs from a nearby farm. Smoked kippers - a Scottish favourite - are available all-year round, in addition to organic smoked salmon and mini-haggis to introduce even the most apprehensive guest to a Scottish staple. Porridge oats, fresh fruit, cereals and freshly-ground coffee are also among the offerings. Guests are also treated to Jane's home-baking ranging from her delicious homemade tablet to shortbread biscuits to griddle scones at breakfast. Jane is happy to accommodate special dietary requirements - please let her know at the booking stage or at least a few days before you arrive.